SAKE is a Japanese rice wine made by fermenting rice that has been polished to remove the bran. Unlike wine, in which alcohol (ethanol) is produced by fermenting sugar that is naturally present in grapes, sake is produced by a brewing process more like that of beer, where the starch is converted into sugars before being converted to alcohol. The brewing process for sake differs from the process for beer in that, for beer, the conversion from starch to sugar and from sugar to alcohol occurs in two discrete steps. Like other rice wines, when sake is brewed, these conversions occur simultaneously. Furthermore, the alcohol content differs between sake, wine, and beer. 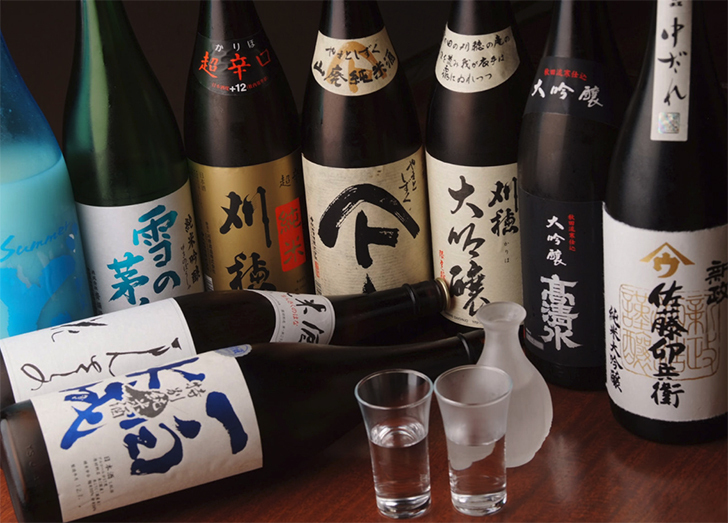 Wine generally contains 9%-16% ABV, while most beer contains 3%-9%, and undiluted sake contains 18%–20% (although this is often lowered to about 15% by diluting with water prior to bottling). 10 Amazing Japanese Sake You Must Drink - Tsunagu Japan. After wine, is sake the new drinkable investment? - The Telegraph. eSAKE - Premium Japanese Sake. History of Sake - SakeGuru. Japan's top sake brewers share their secrets - "Where to find the world's best sake." SAKE GURU - since 2011. "The most comprehensive sake dictionary available." SAKE SOCIAL - "The largest online retailer of Japanese Sake." All our Sakes. SAKE WORLD - "All you need to know about Sake." Types of Sake, ratings, reviews, online store, professional courses, and more. TRUE SAKE - "America's Premier Sake Store." URBAN SAKE - "Sake News, Education, Events and More!" Where to find the world's best sake - CNN travel. DAISHICHI SAKE BREWERY - established in 1752. Dassai - "We brew sake for sipping." Hakkaisan Daiginjo - "Our daiginjo has a flavor that is very clean and elegant, just like the snow covered Hakkaisan mountain. Select high quality sake rice is polished down to 40% remaining and only brewed during the coldest mid-winter season." Hakkaisan Junmai Ginjo - "This smooth and mild-tasting sake is as clean and crisp as a cold, clear day in winter. The taste evokes the gentle flavor of delicious rice." Hiroki Sake Brewery - "Fukushima’s Rejuvenated Sake Star." ICHINOKURA brewery - leading sake brewery in Japan, was founded in 1973. ISOJIMAN PREMIUM SAKE - "Born from the harmony between carefully selected sake rice, excellent water (soft water) from the South Alps in Japan, and the brewers." JUYONDAI SAKE - "Elegant with a very fruity with a clear woody fragrance. This woody smell divides opinions with many loving it." Kenbishi Sake Brewing Co. - since 1505. Known as the first sake brewery to be branded in Japan. In days of old, Kenbishi was very popular sake enjoyed by samurai. On the eve of major military battles. Kikusui SAKE CO. - "It is very light and dry. Sparkling type is also available." KOKURYU SAKE - "If we make good sake, people will support it." That’s been our motto since Kokuryu was founded in 1804 in the mountains of Fukui. Koshi no Kanbai - "Made in the heart of Niigata, the most renowned sake-producing region in all of Japan. The pristinely cold, snowy winters contribute to making this the idea environment for craft sake brewing, and the history and culture of the region define its character and terroir." KUBOTA HEKIJU SAKE - "Clean, Dry, Crisp, & Cutting." Mizbasho Ginjo - "Nagai Shuzo has created a sake that will be propelled to the elite sake brands in Japan and throughout the world. This sake can be enjoyed as you would enjoy a fine glass of wine." Shimizu Seizaburo Shoten - since 1869. Suisen Kibo Junmai Cup - first ever sake to be distributed to the US.